When a regular fat like corn, soybean, or palm oil is blasted with hydrogen and turned into a solid, it becomes a trans-fat. These evil anti-nutrients help packaged foods stay “fresh,” meaning that the food can sit on the supermarket shelf for years without ever getting stale or rotting. Eating junk food with trans-fats raises your “bad” LDL cholesterol and triglycerides and lowers your “good” HDL. These fats also increase your risk of blood clots and heart attack. Avoid palm oil and other trans-fats like the plague, and kiss fried foods goodbye too, since they’re usually fried in one of these freakish trans-fatty oils. When a whole grain is refined, most of its nutrients are sucked out in an effort to extend its shelf life. Both the bran and germ are removed, and therefore all the fiber, vitamins, and minerals. Because these stripped down, refined grains are devoid of fiber and other nutrients, they’re also easy to digest — TOO EASY. They send your blood sugar and insulin skyrocketing, which can lead to all sorts of problems. Replace processed grains with whole grains, like brown or wild rice, whole-wheat breads and pastas, barley, and oatmeal. Aspartame (NutraSweet, Equal), saccharin (Sweet’N Low, SugarTwin), and sucralose (Splenda) may be even harder on our metabolic systems than plain old sugar. These supposedly diet-friendly sweeteners may actually be doing more harm than good! Studies suggest that artificial sweeteners trick the brain into forgetting that sweetness means extra calories, making people more likely to keep eating sweet treats without abandon. Nip it in the bud. Scan ingredient labels and ban all artificial sweeteners from entering your mouth. Monosodium glutamate is a processed “flavor enhancer.” While glutamates are present in some natural foods, such as meat and cheese, the ones exploited by the processed-foods industry are separated from their host proteins through hydrolysis. The jury is still out on how harmful MSG may be, but high levels of free glutamates have been shown to seriously screw with brain chemistry. Don’t fall prey to chemical flavor enhancing. Just play it safe and flavor your food naturally. Often called “America’s toughest fitness trainer,” Jillian Michaels has appeared on the U.S. and Australian versions of The Biggest Loser. 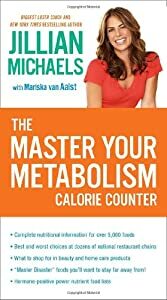 Jillian is a New York Times bestselling author of five books: Master Your Metabolism, Master Your Metabolism Cookbook, Master Your Metabolism Calorie Counter, Winning by Losing, Making the Cut.